As a teacher, Jesus was not afraid to repeat Himself. One such example is the parables the Talents (Matthew 25:14-30) and the Ten Minas (Luke 19:11-27). While the two share several parallels, they also have several major differences. It is these differences that lend to slightly different applications. In preparing to write on the parable of the Ten Minas, I thought it was helpful to see the similarities and differences side-by-side. It’s my hope that you will benefit as well from this short comparison. Location: Told in Jerusalem on the Mount of Olives (ref. 24:3). Told in Jericho (ref. 19:1). Audience: Spoken to the disciples. Spoken to the crowd following Jesus. Occasion: Part of Jesus’ answer to the disciples questions regarding when Jerusalem and the temple would be destroyed (ref. 24:1-3). Told because Jesus “was near Jerusalem, and because they supposed that the kingdom of God was to appear immediately” (19:11). Main Character: “A man going on a long journey” (v. 14) “A nobleman” was going “into a far country to receive for himself a kingdom and then return” (v. 12). The Servants: Three servants were called, “to one he gave five talents, to another two, to another one, to each according to his ability” (v. 15). “Calling ten of his servants, he gave them ten minas” each (v. 13). The Citizens: No citizens mentioned. Citizens under the nobleman’s rule hated him and did not want him to be their king. Their hatred led them to send a delegation to attempt to keep him from be crowned king (v. 14). The Interlude: During their master’s absence the first two servants at once “traded with” their talents, each doubling their money. While the third “dug in the ground and hid his master’s money” (vv. 16-18). No details are mentioned of the servant’s actions during the nobleman’s absence. The Main Character Returns: “Now after a long time the master of those servants came and settled accounts with them” (v. 19). “When he returned, having received the kingdom, he ordered these servants to whom he had given the money to be called to him, that he might know what they had gained by doing business” (v. 15). 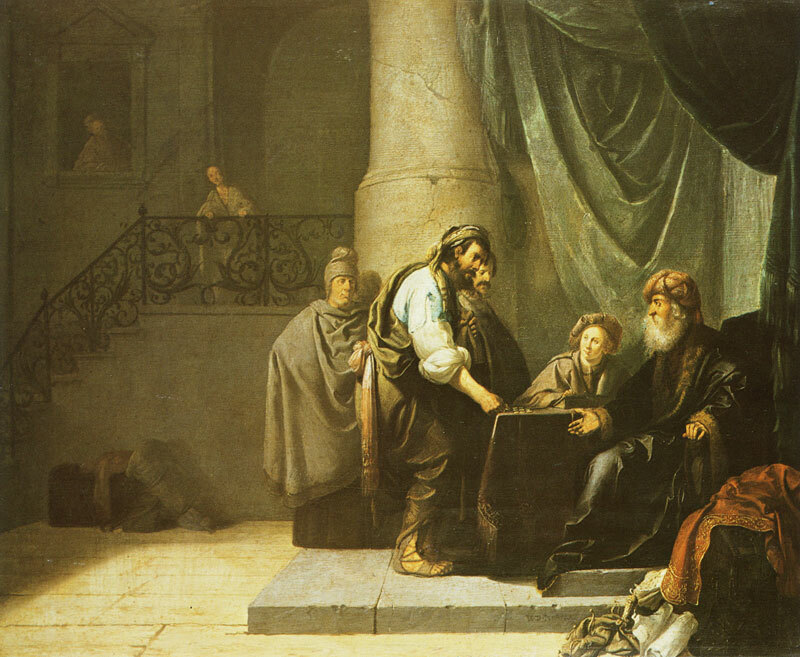 Accounts Settled With Faithful Servants: The first two servants reported they had doubled their master’s money (vv. 20, 22). While ten servants were originally called only three interviews are recorded. The first two servants reported they has turned a profit. One 10x, the other 5x the original amount entrusted to them (vv. 16, 18). The Faithful Rewarded: Both faithful servants, though they had been entrusted with varying responsibilities, were rewarded equally, “Well done, good and faithful servant. You have been faithful over a little; I will set you over much. Enter into the joy of your master” (vv. 21, 23). Each servant was rewarded according to their accomplishments. To the servant who produced 10 more minas the king said, “‘Well done, good servant! Because you have been faithful in a very little, you shall have authority over ten cities’” (v. 17). The second servant, who produced 5 more minas, simply received “authority over five cities” (v. 19). Account Settled With An Unfaithful Servant: The third servant “came forward saying, ‘Master I knew you to be a hard man, reaping where you did not sow, and gathering where you scattered no seed, so I was afraid, and I went and hid your talent in the ground. Here you have what is yours’” (vv. 24-25). Note: excuse came first, then the money was returned. Burying money in the ground was a common way of keeping money safe. Another servant came and said “Lord, here is your mina, which I kept laid away in a handkerchief; I was afraid of you, because you are a severe man. You take what you did not deposit, and reap what you did not sow” (vv. 20-21). Note: money was returned, then the excuse was given. Keeping money in a handkerchief was an unsafe and therefore an uncommon way of holding money. Main Character’s Response To The Servant’s Excuse: The master responded, “You wicked and slothful servant! You knew that I reap where I have not sowed and gather where I scattered no seed? Then you ought to have invested my money with the bankers, and at my coming I should have received what was my own with interest” (vv. 26-27). The king responded, “I will condemn you with your own words, you wicked servant! You knew that I was a severe man, taking what I did not deposit and reaping what I did not sow? Why then did you not put my money in the bank, and at my coming I might have collected it with interest?” (vv. 22-23). Wicked Servant’s First Punishment: The wicked and slothful servant’s talent was taken and given to the servant who had ten talents (v. 28). The reasoning, “For to everyone who has will more be given, and he will have an abundance. But from the one who has not, even what he has will be taken away” (v. 29). The wicked servant’s mina was taken away and given to the servant who had produced ten minas (v. 24). Someone protested this action (perhaps the other servants) because he already had ten minas (v. 25). However the king explains, “To everyone who had, more will be given, but from the one who has not, even what he has will be taken away” (v. 26). Wicked Servant’s Second Punishment: “Cast the worthless servant into the outer darkness. In that place there will be weeping and gnashing of teeth” (v. 30). No specific punishment is mentioned but it could be inferred he suffered the same fate as the king’s enemies. Citizens: No citizens mentioned. Now “as for those enemies of mine, who did not want me to reign over them, bring them here and slaughter them before me” (v. 27). The Application: Jesus would soon be leaving but He would return. In the interim, His servants should faithful steward their God-entrusted resources. Because they will have to give an account for their actions. The faithful will be rewarded, the unfaithful punished. Jesus would soon be leaving to receive His kingdom from the Father. In the interim, His servants should, even in the face of oppositions, faithful steward their God-given resources. Upon the Lord’s return His servants will first be called to give an account of their actions. The faithful will be rewarded, the unfaithful will be destroyed with the Lord’s enemies. ← God’s Will For Your Life Is Not An Enigma! “Rejoice always; pray without ceasing; in everything give thanks” (1 Thes 5:16-18). I don’t know why it still says repent in the preview box.